This lesson provides an in-depth case study to illustrate principles of dam failure modeling and examines some of the critical data inputs and outputs. Output is provided from the U.S. Army Corps of Engineers HEC-RAS model for simulated failures of a large dam. Several simulations are presented that show the impact from varying the size of the breach and the time it takes the breach to fully develop. The lesson also summarizes several infamous large dam failures from around the world and the impacts from other factors are such as reservoir shape and size, the age of the dam, and the material used to construct the dam. Comprises good material for understand in easy way. I had a wonderful experience learning. It is a good clear concepts for new learner. This lesson in very useful my department. For people who have no hydrology knowledge, it's a nice introduction of basic theory and simulation on dam failure. it was very good experience of e-learning. As I am new to this subject but have done a Degree in Geology I found the content very clear and to the point. I have learnt the essential facts on the subject rather than reading a lot of text. The quizzes were also very good during the lessons which reinforced what I had learnt. Very useful content.Need of the hour.Presentation is Extremly good.Time saved. 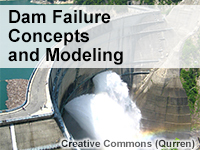 Identify the characteristics of large dams and modes of failure associated with them. Match reservoir and watershed characteristics with the type of model most likely needed to produce a forecast hydrograph during a major dam failure. Explain the changes to headwater, tailwater, and outflow during a dam failure and how breach size and formation time affect these. Describe how HEC-RAS model simulations can be used to explore the impact of breach size and breach formation time on the resulting downstream flows. Describe the basic characteristics of downstream inundation and hydrographs associated with dam failures.